VISALIA – The heart of downtown was again pulsing with music last week as Visalia’s favorite nightspot reopened. The Cellar Door kicked off the hotspot’s surprising resurrection on Nov. 21 with a dual concert of hometown harmony and local lyrics. 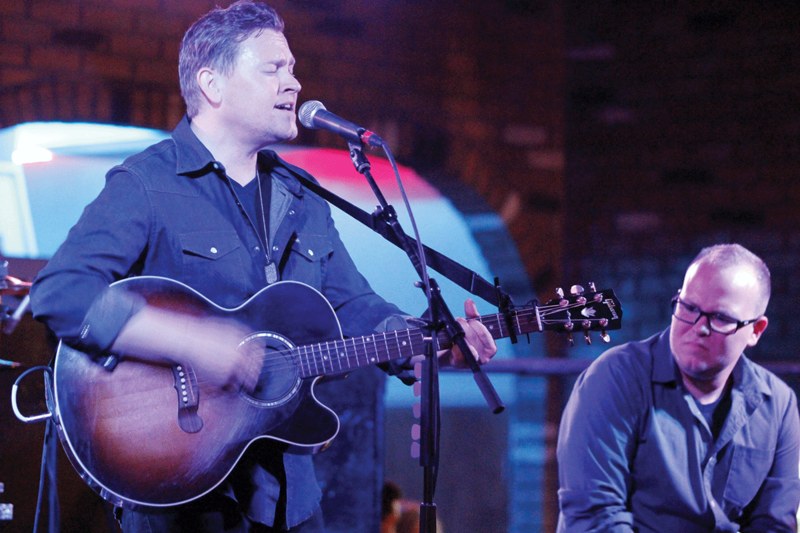 New owners Ryan Sullivan and Marc Dwelle purchased the business and the building four weeks ago and quickly put together an event for Thanksgiving weekend, one of the busiest weekends for live music and entertainment of the year. Sullivan said Dwelle, who is on Sound N Vision’s board of directors, will continue the nearly 10-year tradition of booking music acts through the Visalia-based non-profit. Dwelle, who also owns Speedy Car Wash in Visalia, wants to build on the Cellar Door name. “Bands know the Cellar Door name in LA and San Francisco,” Sullivan said. Sullivan said the nightspot is hoping to keep its rock ‘n’ roll vibe but is expanding beyond indie rock to include some popular music as well as country music. There was no mistaking a concerted effort to include country-leaning, locally grown artists on opening night. JJ Brown opened the concert card with his brand of storytelling country music. After a career in the Navy, the singer songwriter moved to Nashville where he worked as an assistant engineer and sang background vocals on miscellaneous indie label projects. Brown co-wrote a song titled “Through All The Earth” with the band The Turning and Grammy Award winning producer Nathan Dantzler (ND Rock), while the band was signed to the record label Rocket Town. The song was placed on the album “Learning to Loose” which was placed in Wal-Mart, F.Y.E., and many other popular retail chains nationally. He has shared the stage with artist like Clint Black, Kevin Costner, Peter Frampton, the Doobie Brothers, Austin Webb and Drake White. The next performer, Leaving Austin, is the new generation of country music. Leaving Austin consists of members: Austin Machado on lead vocals, Davis Forney on guitar and harmonies and Michael Stevens on bass. Born and raised in the Central Valley, growing up on country, pop and rock n’ roll, they decided it was time to get back to their roots and sing country their way. Michael and Davis grew up together playing music at church in Visalia. “We want to be all inclusive and appeal to every kind of music fan,” Sullivan said. The bar is being run by Tate Darwin, a trained bartender with culinary experience. Sullivan said Darwin hopes to expand its craft beer menu as well as developer craft cocktails using local flavors such as citrus. The new owners have also talked with Darwin about capitalizing on the popularity of “pop-up” kitchens. These former supper clubs of the 1960s allow chefs to run a kitchen for a single event or special occasion, which can include a festival, anniversary or unique pairing. The idea is trending in Los Angeles and San Francisco were the demand for off-menu specialty dishes is driven by a diverse and limitless foodie appetite. The “reopening weekend” continued on Nov. 23 with Bazmati and on Nov. 24 with The Box. The music continues this Friday, Nov. 30 with the ska and reggae stylings of For the Record and IndoSurf. Sullivan said they are also considering a Jazz night. “We want to make this an all-out art, music, bar and restaurant,” Sullivan said.